MISSING LINK has been gone and presumed dead for years now. No one has heard anything from them since the release of their sophomore album Lobotomized. Rumors suspect that Thrash Metal band ARTILLERY had involvement in their disappearance, but no concrete evidence has been found. Regardless of the mysterious fall of MISSING LINK, it was one of those bands that shouldn’t have gone so soon. Years after disbanding, Vic Records have decided to do a reissue of Lobotomized and deliver another round of headbanging Thrash that may have been missed the first time around. 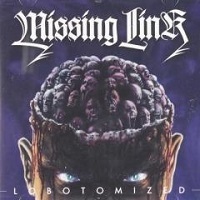 Get ready and hear the sounding alarms of title track “Lobotomized”, because MISSING LINK sneaks up on ‘ya! The best way to describe MISSING LINK is to imagine if JUDAS PRIEST and EXODUS joined forces. NWOBHM meets classic 80s Thrash from Copenhagen; the epic combo you never thought you always wanted. A driven, all-cylinders-firing beat that still makes plenty of time to party. In the forbodeing “House of Fear” take a trip through a slaughterhouse of your nightmares where Niels Skovgaard’s bass playing reigns prominent throughout yet remains in the shadows of runaway anxious thoughts. Guitar duo from Hell Michael and Morten Stutzer play cohesively instead of competing to outdo one another (save for the title track), each performing their own solo on nearly every song. “All Mine” is what happens when affection turns into obsession, while “Troublemaker’s Benefit” veers off wildly into Stoner territory with molasses, SLEEP-caliber tempos and fuzzed out riffs. I’m almost a hundred percent “Devil or God” is about vampires “…A flash in the lights expose the nature of my kind, as I bite she looks in wonder… Devil or God, you never can tell. Hungry for blood, is this Heaven or Hell?”. Even though this album was released in 1997, MISSING LINK predicted some of the technologies that improve/invade our lives today in “Persistence of Desire”; digital chips, and ever-watchful cameras, the rise of technology overshadowing basic human nature. The sound sounds awfully Demolition Man inspired. MISSING LINK was a raging beast of a band that was too short-lived.